We provide a comprehensive and critical review of the h-index and its most important modifications proposed in the literature, as well as of other similar indicators measuring research output and impact. Extensions of some of these indices are presented and illustrated. Adler, R., Ewing, J., Taylor, P. (2008), Citation Statistics. Joint IMU/ICIAM/IMS-Committee on Quantitative Assessment of Research. (Available at: http://www.mathunion.org/fileadmin/IMU/Report/CitationStatistics.pdf). Batista, P. D., Campiteli, M. G., Kinouchi, O., Martinez, A. S. (2005), Universal Behaviour of a Research Productivity Index. ArXiv:physics/0510142. (Available at: http://arxiv.org/ftp/physics/papers/0509/0509048.pdf). Beirlant, J., Einmahl, J. H. J. (2007), Asymptotics for the Hirsch Index. (Available at: http://econpapers.repec.org/paper/dgrkubcen/200786.htm). Chai, J.-C., Hua, P.-H., Rousseau, R., Wan, J.-K. (2008), The Adapted Pure h-Index. Proccedings of WIS 2008, Berlin Fourth International Conference on Webometrics, Informetrics and Scientometrics & Ninth COLLNET Meeting. (Available at: http://www.collnet.de/Berlin-2008/ChaiWIS2008aph.pdf). Egghe, L. (2008a), Modelling successive h-indices. Scientometrics (to appear). (Available at: http://dx.doi.org/10.1007/s11192-007-1968-5). Egghe, L. (2008b), Dynamic h-index: The Hirsch Index in function of time. Journal of the American Society for Information Science and Technology (to appear). (Available at: http://dx.doi.org/10.1002/asi.v58:3). Evidence Report (2007), The Use of Bibliometrics to Measure Research Quality in the UK Higher Education System (A Report Produced for the Research Policy Committee of Universities, UK, by Evidence Ltd., a Company Specializing in Research Performance Analysis and Interpretation). (Available at: http://bookshop.universitiesuk.ac.uk/downloads/bibliometrics.pdf). Hirsch, J. E. (2007), Does the h-index have a Predictive Power? (Available at: http://www.pnas.org/content/104/49/19193.full.pdf+html). Jacsó, P. (2008a), Testing the calculation of a realistic h-index in Google Scholar, Scopus, and Web of Science for F. W. Lancaster. Library Trends. (Available at: http://findarticles.com/p/articles/mi_m1387/is_/ai_n28076518). Kosmulski, M. (2007), MAXPROD — A new index for assessment of the scientific output of an individual, and a comparison with the h-index. International Journal of Scientometrics, Informetrics and Bibliometrics, 11(1). (Available at: http://cybermetrics.cindoc.csic.es/articles/v11i1p5.pdf). Lehmann, S., Jackson, A. D., Lautrup, B. E. (2005), Measures and Missmeasures of Scientific Quality (to appear). (Available at: http://arxiv.org/abs/physics/0512238). Miller, C. W. (2006), Superiority of the h-index Over the Impact Factor for Physics. eprint arXiv:physics/0608183. (Available at: http://arxiv.org/PS_cache/physics/pdf/0608/0608183v1.pdf). Orbay, M., Karamustafaoğlu, O., Öner, F. (2007), What does hirsch index evolution explain us? A Case Study: Turkish Journal of Chemistry. (Available at: http://arxiv.org/ftp/arxiv/papers/0704/0704.1602.pdf). 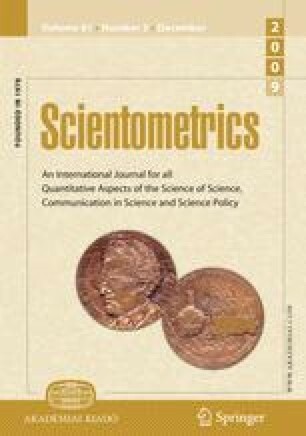 Persson, O., Glänzel, W., Danell, R. (2008), Inflationary bibliometric values: The role of scientometric collaboration and the need for relative indicators in evaluative studies. Scientometrics (to appear). (Available at: http://dx.doi.org/10.1023/B:SCIE.0000034384.35498.7d). Publish or Perish (2007), User’s Manual, http://www.harzing.com/resources.htm#/pop.htm, accessed on June 12, 2007. Rousseau, R. (2006a), Simple models and the corresponding h- and g-index. Science Technology Development (to appear). (Available at: http://eprints.rclis.org/archive/00006153). Rousseau, R. (2007a), A case study: Evolution of JASIS’ Hirsch index, Science Focus. (Available at: http://eprints.rclis.org/archive/00005430/01/Evolution_of_h_JASIS_rev.pdf). Saisana, M., d’Hombres, B. (2008), Higher Education Rankings: Robustness Issues and Critical Assessment, JRC Scientific and Technical Reports 23487 EN. (Available at: http://crell.jrc.ec.europa.eu/Publications/CRELL%20Research%20Papers/EUR23487.pdf). Schreiber, M. (2007a), Self-citation corrections for the Hirsch index. EPL 78 30002, 1-6. (Available at: http://dx.doi.org/10.1209/0295-5075/78/30002). Schreiber, M. (2007b), The Influence of Self-citations on Egghe’s g Index. (Available at: http://arxiv.org/PS_cache/arxiv/pdf/0707/0707.4577v1.pdf). Tol, R. S. J. (2007), Of the h-index and its Alternatives: An Application to the 100 Most Prolific Economists. Working paper FNU-146. (Available at: http://www.fnu.zmaw.de/fileadmin/fnu-files/publication/working-papers/alternativeindexwp.pdf). Wan, J.-K., Hua, P.-H., Rousseau, R. (2007), The Pure h-index: Calculating an Author’s h-index by Taking Co-authors Into Account. Preprint. (Available at: http://eprints.rclis.org/archive/00011401 /01/pure_h.pdf). Wu, Q. (2008), The w-index: A significant improvement of the h-index. (Available at: http://arxiv.org/ftp/arxiv/papers/0805/0805.4650.pdf).